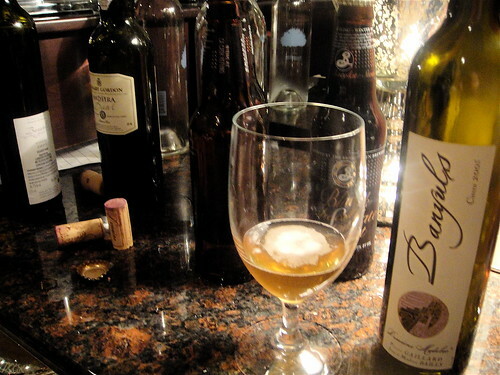 It was a tough crowd of fervent wine and beer lovers. So let’s kick this battle off with some oysters, a strong golden ale, and a chablis…. Leah rebuffed with Chablis, a wine which is 100% Chardonnay from Burgundy. This particular wine was from Domaine des Malandes, a small producer fittingly featuring a husband-and-wife team (“the wife does most of the work,” she quips. Clearly the battle lines are being drawn!). This Chablis was fermented in new oak barrels, so it keeps all of its acidity to stand up to the richness of the oyster gratin, but has a little more richness itself to complement the dish. “I think you’re going to find it has more minerality than the beer,” Leah says with a twinkle. We dove in, sipping first, then tasting, then sipping again as instructed. 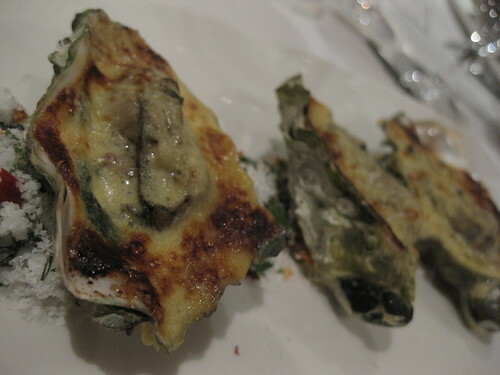 The oyster gratin was indeed rich and creamy, just ridiculously good. But I knew I’d already lost this round to Kirk; Chablis is not one of my favorite wines and the pairing seemed conventional. The beer however, was superb. 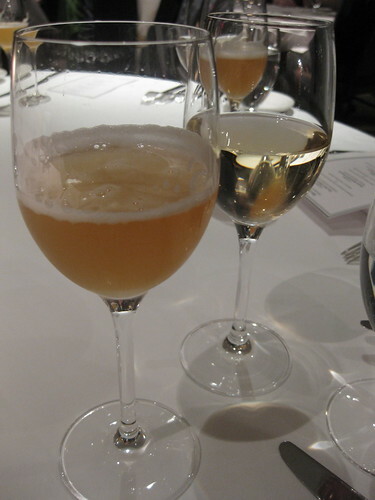 Our table was in agreement – only one vote for wine – we all thought the wine would be excellent had it been raw oysters, but the beer perfectly stood up to the richness of the dish. “Do you know what wine has that beer doesn’t have?” Leah asks as we start the second course, “Place.” She paints a picture of a seaside meal in Italy with the fresh ingredients playing off the local wine. Sigh. The Greco di Tufo she chose is from Campania near Naples, and it’s a rich wine with beautiful acidity to play off the salty olives and ham in the dish. I’m already salivating. Thor showcases Brooklyn Local 1, an American effort at a farmhouse ale style. Farmhouse ales evolved at end of brewing season as a way to keep beer throughout the summer, by brewing strong and hop heavy with lots of spices to keep it from going sour. “I’d like to bring up what beer has that wine doesn’t,” Thor says wryly, “and that’s pretty much everything.” The room erupts in laughter, but he’s got a point – beer consists of the base of water, malt, hops and yeast – but from that base can be added other ingredients like sugar, fruit, or spices, which doesn’t happen with wine. Does that make it superior with food pairings? That’s what he’s trying to prove. The beer pairs well with the mildness of the monkfish, but the wine stands up to the olives and ham. I really liked the beer on its own, which was surprising to me as I’m not usually a hoppy beer drinker, but this has an elegant smoothness. I’m shocked when Kirk, who’s been waffling, goes with the wine. “The pairing just excited me more,” he says. Through the table is torn for a moment, soon we all agree for wine, as does most of the room. Thor chose a strong dark wheat beer from a grand old brewery, made entirely within the German purity law that strictly regulates ingredients (water, barley, hops, yeast only). I’m shocked at the variety of flavors evident – cloves and bananas! It’s unbelievably delicious. He tries to seduce our vote by showing the preferred pouring method, straight upside down into a glass. But there’s no need for show – this beer is incredible. I can’t believe the banana note. Our table is convinced it would be perfect with apple or pumpkin pie. “When you have a sweet dish, the sweetness of the wine should be equal or greater than the sweetness in the food,” Leah says as the Alsatian Pinot Gris is poured. Noble rot is obviously present, there’s a beautiful golden color and sweetness to it without losing the acidity, with some apple notes and a long finish. 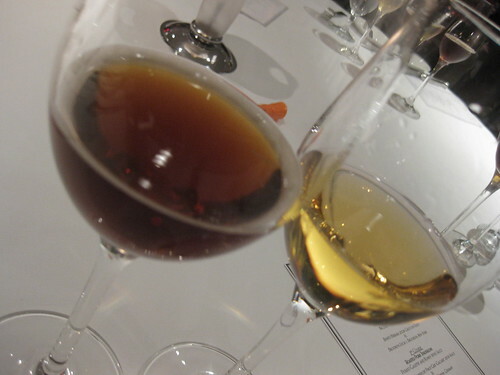 “It’s like drinking velvet,” a tablemate sighs. The ante has been upped – both are amazing choices. “Both have very similar characteristics,” Kirk says, as we are momentarily distracted by how divinely tender the pork is, the buttery carrots, the potato gallette – the whole table is sighing contently. But choice has to happen, and though I’m surprised at how much I love the beer, I have to go with my favorite wine varietal. I try to convince Kirk that the wine takes on the dish as a whole, whereas the beer is best solo. But, he goes with the beer. Ah, fortified wine. Leah explains that its beginnings were an accident, when neutral grape spirits were added to wine to keep it on long ship voyages. A barrel was left in the sun, and they liked the taste so much a whole industry was born. She’s picked Madeira, a fortified wine with a balance of sweet earthiness to cut through the Epoisse cheese, which is a bit stinky, and complement the beets and walnuts. Thor counters with a French beer that’s a lovely delicate froth, and asks us to taste it first with just a shaving off of the cheese. “Take a big swig of that beer and it turns the cheese into ice cream,” he says, and remarkably, it does! Kirk sways me towards the beer, as it’s so lovely and light with the richness of the cheese, but in the end I can’t resist the complexity of the Madeira. 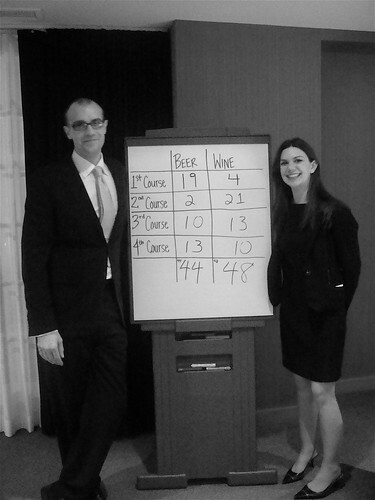 The vote count is identical to the last course, but flipped for beer. It’s close, 44 to 48, so we go to a tie-breaker course! Thor pours an imperial stout, and I get nervous. Imperial stout was the first beer I actually fell in love with – the roasted malt taste, the chocolate espresso flavor! As a coffee drinker, I love the idea of pairing it with dessert. “This is an advanced beer,” Kirk says. Maybe he’s buttering me up. Banyuls is Leah’s response, a fortified wine from Southern France made from grenache, with a rich sweet fruit taste to complement the truffles, one of which is raspberry. “That’s phenomenal, transcendent,” Kirk says upon sipping it, just as Robert Wiedmaier enters to applause. Chef ex machina? He gives us a little talk on the rise of beer pairings and how both wine and beer can be successful with food, teasing both Thor and Leah equally. I don’t sense any bias! The grand total for the evening? 55 for Beer, 60 for Wine. The room goes wild! Thor has to go buy Tide to do all that laundry for a month. But, he’s gracious about the loss and Leah doesn’t gloat. I think everyone left the tasting more intrigued about pairing beer with food. I certainly did; maybe that’s why Kirk seems non-plussed by beer’s loss. He knows a potential convert has been made. Salut! Many thanks to Charissa Benjamin at Kimpton for allowing us to attend at a discount.